I am the Chairman of Bill Good Marketing. We coach financial advisors. We help them run a better business. The investment craft is their department. Our focus has always been to help them minimize the time spent on the organizational part of being a financial advisor so they can spend their time actually doing the job of a financial advisor—providing sound advice (imagine a doctor so buried in the day-to-day operations of his or her practice that little time remains to actually practice medicine). I have been a player in this industry since 1980. During that time I have met tens of thousands of advisors. I first met Bob Cable around 1989. Early in our relationship, I could tell he was passionately engaged in success. He realized that if his clients succeeded his business would as well. He brought a unique set of skills to the industry. With a science and engineering background, he was able to impose a rigour to his analysis that I have rarely seen. But Bob is not just a thinker. He’s a serious student of investing. He’s also a superb writer. And he acts. Perhaps there is no better example of this than what happened on that hideous day, 9/11. As Bob told the story to me, he was at his cottage, doing some research. He went online around 10:00 a.m. and noticed that the stock market wasn’t open. Strange. So he turned on the TV and saw what the world was watching. After calling home to make sure his family was okay and contacting his staff as well, Bob knew he had to get a letter out to his clients as they’d want to know how safe their money was and if they should be doing anything. I’m sure you know that the financial services industry is a very heavily regulated industry, both in the United States and Canada. Bob told me that this letter just flowed and it’s the only time he’s never edited a single word. But to send it out required Head Office approval. Since no one knew what was happening at the time, Scotia’s executive team had wisely decided to vacate their office tower in downtown Toronto. So Bob had no way of getting approval to send the letter. And there was no way to know when that office might reopen. Sometimes, as the old saying goes, it’s easier to ask forgiveness than permission. So Bob decided that he would take responsibility for any repercussions and instructed his staff to get the letter out immediately. In retrospect, Bob’s 9/11 letter offered exactly the right advice. Yes, the market was closed for several days. And, yes, it dropped 5% when it re-opened a week later. But by November, it had completely recovered. Take a moment to read Bob’s letter. And then I will tell about its impact. Today will never be forgotten. The horrific and senseless attacks have caused unknown numbers of innocent people to lose their lives. The impact beyond the lives lost may never be known. I want to help you through this financially by outlining from experience what is likely to happen. First, your guaranteed investments remain solid and safe. However, there will be panic in the stock market(s) when they reopen. At this point, I do not know when markets will again open for trading. Every incident that causes a stock market panic is different. But the reaction in the markets usually has a course that is strikingly similar. So here’s where you need to sit back and think this through. Here’s what the markets are likely to do. In every panic, the market will open way down initially. Please understand, you cannot get out before this happens. If you rush in to sell, you will most likely get a price that is around the worst of the day. Remember I’ve seen this before. In the past, those who got out did so to make themselves feel better. As time passed and they looked back, they wondered what they could have been thinking to sell at such low (panic) levels. The market, for some time, will likely be subject to wide swings based on the news of the moment. But in every case of panic, the market has recovered. I do not expect it to be any different this time. We have absolutely no control over what the market does. What we can and need to control is how we react to it. Sure there will be disruptions. Some companies may shut down operations for a few days. Most businesses will be impacted, some more than others. But think for a minute about the companies you own. The Canadian bank that deals with the person down the street for their mortgage or car loan. The drug company that makes drugs for hypertension or asthma. The company that processes your credit card transactions. Sure they’ll be impacted but the impact on their business is probably, at most, minimal. And most important of all to you and to me is that it is very likely to be temporary. All of these temporary company setbacks add up to a very likely temporary market setback. Setting the financial world aside, you can look around you and be more thankful than ever for what you do have. Your health. Your friends. Your family. Your faith. Those you love and who love you. And if you’re so inclined, say a prayer for those who need it most today. If you need to talk, I’ll be in the office (if permitted) this evening until 10:00 p.m. or later if need be. Feel free to call. If I don’t answer, it’s because I’m either already speaking with someone else or security has not allowed me to be there. Leave a voicemail and a number where I can reach you and I will if at all possible, call you back. P.S. Please note. Most of our clients received this communication the same day by either fax or email. If you prefer to continue to wait for the mail, that’s fine. If however you’d prefer to join our “same day list”, please give us your fax number or email address. No sooner had Bob sent this letter over to his staff than he sent a copy to me. I had just posted one for our clients. I immediately saw Bob’s was far better. I pulled mine down and posted his. 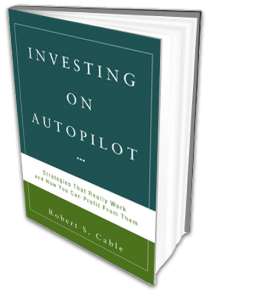 We sent out an email blast to 2,500 or so advisors. Then we learned the Dean Witter email servers were in the World Trade Center. So we put together a team and called all of our Dean Witter clients. 9/11 was a Tuesday. By late that afternoon, tens of thousands of letters and emails were on their way. On Thursday, I decided that every advisor in the United States and Canada should send this letter. I then emailed about 25,000 copies. By Friday, some of the talking heads on CNBC and other finance shows were talking about a letter that advisors all over the country were sending out. On Saturday, CBS Marketwatch reproduced most of the letter—no credit given. But that was OK. The game was: don’t panic when the market opens on Tuesday. Yes, the market did open down 5%. But there was no rout. Did Bob’s letter cause the market to hold? You bet. Countless thousands of investors did not panic. Two months later, they were whole. This is just one example of the countless smaller instances of the kind of experiences and advice Bob’s clients have come to expect. 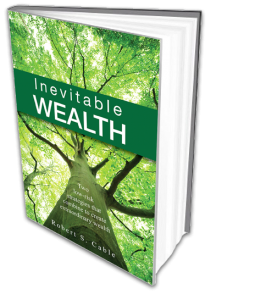 Whether you were fortunate enough to have read Bob’s original 9/11 letter or not, you need to read Inevitable Wealth.